In which The Gay Recluse regrets not seeing Waltraud Meier’s Isolde. 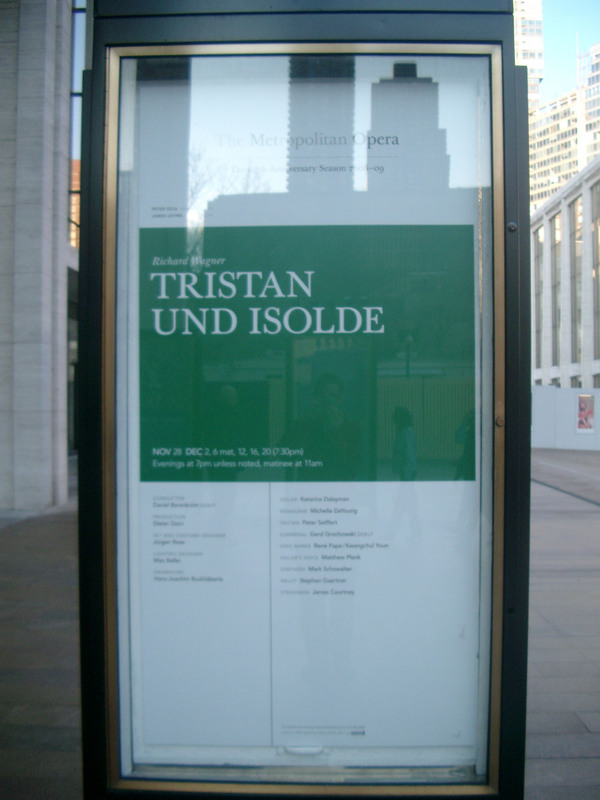 Before Friday night’s show at the Met, both the lead Isolde and her cover were sick and had to cancel. This sometimes happens! At the last minute, the Met was able to track down Waltraud Meier, who agreed to fly in from Munich for the show. Though a very experienced Isolde — and who has recently worked with Barenboim* — this production was new to her; and then the weather was horrible and the plane circled JFK for five hours! (Omg jet lag!) By the time she arrived backstage, there was no time to rehearse, so the director quickly coached her through the staging as the minutes ticked down to the prelude. It was a sold out house: adrenaline was running high on both sides of the curtain. It could have been a disaster, but by most accounts (except sadly, ours! ), Waltraud Meier’s performance was filled with a remarkable fury and vulnerability made all the more incredible by the fact that she hadn’t slept or rehearsed. Though sorry to have missed it, we’re consoled by the idea that even at the highest levels, things in the theater can and do go wrong, yet can sometimes be restored with such serendipitous brilliance. It gives us hope as we consider the inevitable mishaps our own life, to understand that an alchemy exists by which these failures can be transformed — at least for a little while — into something better than we could have ever expected. *Here’s a clip of Waltraud Meier from last year’s production at La Scala. I assume one would prefer only one leaf on a tree, one kernel of corn on an ear, one fencepost clicking by as you ride alongside of it. After all, they’re all the same after you’ve seen one. This was one of the performances I had tickets for–what a wonderful surprise! Her voice was lovely and powerful, and she acted the hell out of the role. I would have never known she had little sleep and zero rehearsal, though Peter Gelb did come out before the opera began and informed us that by the time she would be singing the Liebestod, it would be morning in Munich. I really love the design and staging of this production (except for those tchotchkes in Act III; what were they thinking?!). The lighting design is the most effective and beautiful I’ve seen in an opera; the way the gold light pours out of the doors into the blue night at the top of Act II–unforgettable. My favorite part of the opera was Brangane’s “Einsam wachend in der Nacht.” Michelle DeYoung’s voice is perfectly suited for this section, and it just floated over the orchestra so beautifully, magically. Thanks for sharing, Ricky — I also love Brangane’s “Einsam…” so haunting and beautiful! What a big wow! Herr Meier is a real heroine! Methinks she is the greatest female Wagnerian now singing on stage.